These spacious luxury bell tents (internal space of 45 m2) all have wooden decking, sun loungers, shaded canvas awnings and stunning views of the countryside. 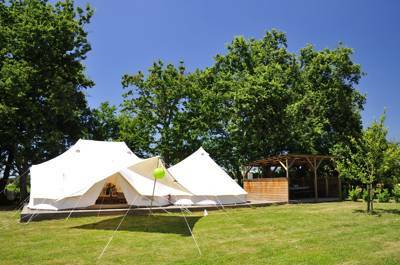 The beautifully decked out canvas retreats offer two bedroom linked Bell tents (6m and 5m linked) for up to 6 people. Bedding is of the highest quality with luxury cotton sheets, feather pillows and duvets. The lounge or outdoor decking area are both ideal spaces to stay up late chatting under the stars, whilst the kids are snuggled up in bed. Each Bell tent has its own beautifully appointed private shower room facilities with organic soaps and toiletries and fluffy hotel towels included! Let's not forget the complimentary gifts upon arrival, which certainly add to the personal touch at La Vie en Rose. The communal outdoor lounge area in the heart of the campsite has some comfy sofas awaiting you and an area to relax in the shade, a perfect place to enjoy a glass of wine! Table tennis, pool table and a selection of board games and books are available for both little ones and grown ups, and it's a great place to meet and socialise with other guests. The new heated salt water swimming pool with splash area is a perfect place to escape the summer heat, whilst the games area offering Petanque, Basketball, Volleyball, Swingball, Football, slide, swings and childrens play house will keep them happy for hours on end! La Vie en Rose is a family run site and welcomes your children. There are travel cots, sheets, blankets, high chairs, spare push chair, baby carrier, baby bath / change facilities, child safe utensils and activities to keep them occupied! Most of all, there is space for them to roam free, so the whole family can relax! The on site a little 'shop' has a small supply of wines, chilled beer & soft drinks as well as a tourist information area.